Music Credit: Everything by Everyone Moves Away. Licensed by Musicbed. Ceremony + Cocktail Music | Masters Musicians Inc. This may be one of the most epic wedding receptions I have ever seen! What a way to end such a beautiful day! I know, right?!! The energy was electric!! Such a fun party!! Wow this wedding was an epic, luxury affair! Her dress was just gorgeous and I loved the dancers at the end! Wow! The colors! The dress! The gloves! Everything about this is perfection. Nothing short of amazing happening here! You did an amazing job capturing this couple’s entire wedding story! Well done! And that party looked like it was nothing short of epic! Thank you so much! And yes, so much fun! These are beyond gorgeous- my jaw is literally on the floor with how perfect everything was from the couple to the venue and the images you got of it all! Love the pink backdrop for the first look, and the black bridesmaids dresses, and the night ceremony… sigh*. I could go on. Loved looking through these- awesome job!! The minute I saw that pink building I thought “I bet this is Florida” and I was right! Fellow Florida photographer here, and I have to say you captured the tropical beauty absolutely perfectly! I love the touch of elegance the gloves add to the bride’s look. How unique! That ending though! This is so epic! Everything is this wedding is perfect. 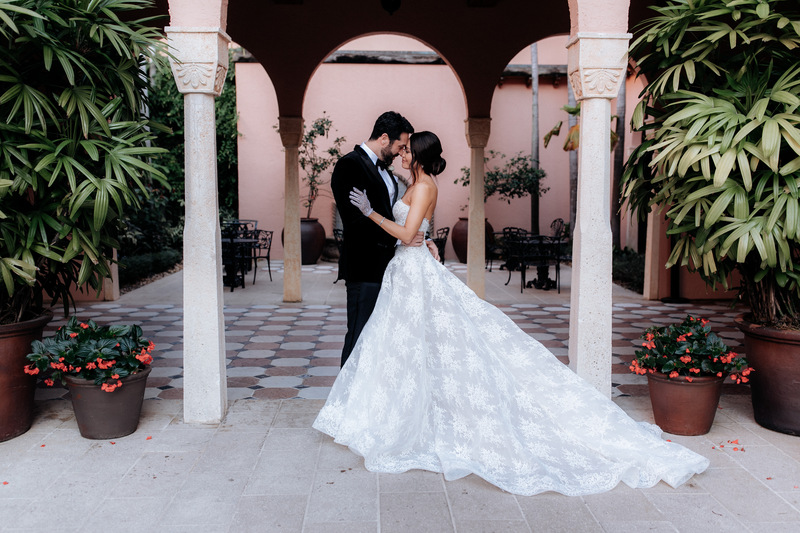 You beautifully captured their love and relaxed feel in such an incredible space. Amazing.